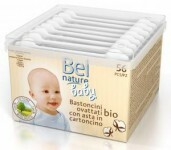 Bel Nature Baby Cotton Buds - 56 pcs. Bel Nature Cotton Buds - 200 pcs. Bel Nature Cotton Pads - 70 pcs.